The most celebrated day in any country’s calendar is the day it acquired independence. Each country commemorates their independence/national day with renewed energy, patriotism and resolutions. Dubai, not much different in this respect, also celebrates its national day with the same pride that other countries show in their national days. It was the 2nd of December when Dubai won back its independence from the British Colonial Rule, and since then, the day is celebrated each year. Different programmes and events are held, entries into Dubai’s monuments are opened for the general public and a variety of functions are hosted. This celebratory fever is not just restricted to the nationals of UAE because foreigners are also witnessed participating and enjoying the Independence Day celebrations just as much as anyone else. According to recent discoveries, the earliest human settlement in Dubai dates as far back as 8,000 BC. The city has seen a turbulent history when it was at an almost-war like situated with Abu Dhabi in 1947, until Britain intervened and acted as an arbitrator. It was then that there was a ceasefire and Dubai started to grow, constructing its own airport, electricity and telephone lines etc. Later in 1971, Dubai and Abu Dhabi along with 5 other emirates created the United Arab Emirates after Britain left the Persian Gulf. This was followed by Dubai having a unified currency with the other Emirates while it built on its capacity to generate revenue through oil and trade. This was to be a start of the Dubai we see today. 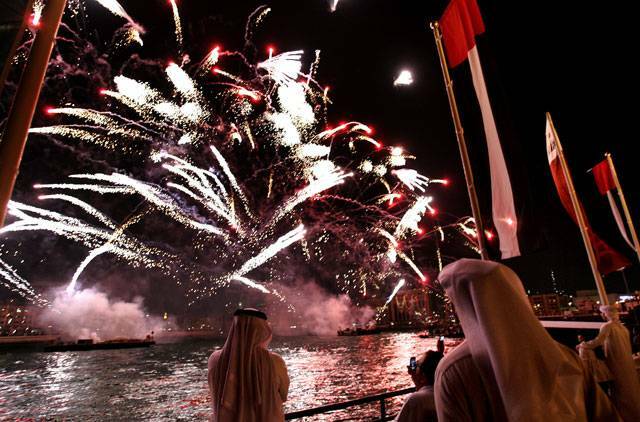 The National Day Festival sees many functions and celebrations through out the city. - All the city is lit up, reflecting the sense of celebration of the residents. - Monuments like Burj Khalifa and Burj Al Arab are made to look even more grand and beautiful. - Different parks are thronged by people looking to go out and celebrate the independence. These include; Mamzar Beach Park, Aquaventure Beach Park and Wonderland Theme Park. - Various events and functions are organized in popular tourist destinations. - Markets and streets are decorated and furnished in a way that reflects Dubai’s true spirit. 2nd December is the day the National Day Festival is held because Dubai gained independence from the British on this date back in 1971. The celebrations start much before the actual National day – sometimes even as many as 40 days earlier.